Last week, I helped to organize a tour of the Butte Fire in Calaveras County as part of the California Rangeland Conservation Coalition summit. 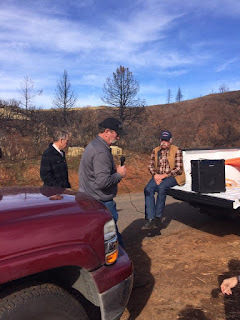 The tour, and the Coalition's summit on the following day, focused on the intersection of wildfire and ranching in California. 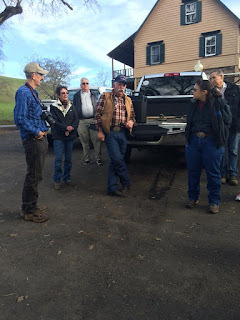 During our tour, we heard from a watershed manager from the East Bay Municipal Utility District, from a local CalFire battalion chief, and from several ranchers who were impacted by the fire (including Doug Joses, whose efforts before and during the fire helped save the town of Mountain Ranch). During the summit on Friday, we heard from researchers and ranchers about fire prevention, fire management, and the need for more research (especially regarding post-fire grazing management). Over the last three years, the Sierra Nevada region has experienced three fires that burned more than 50,000 acres in a single 24-hour period (the 2013 Rim Fire, the 2014 King Fire and the 2015 Butte Fire). I remember hearing a UC Berkeley fire researcher (I wish I could remember his name) talk about the King Fire - he had run a model that predicted that the fire could possibly burn from Stumpy Meadows Reservoir to Hell Hole Reservoir (a distance of roughly 15 miles) in 7 days. The fire made the 15-mile run the next night. Even though our sheep operation is relatively small, I worry constantly about wildfire during the summer months. Fire behavior, at least from my perspective, seems to be changing. Our tour, and our conversations on Friday, revolved around these changes and around changes in, and impacts to, the ranching community. When I was a kid, I remember that most of the properties of 10 acres or more in Tuolumne County (where I grew up) were fenced and had livestock grazing on them. 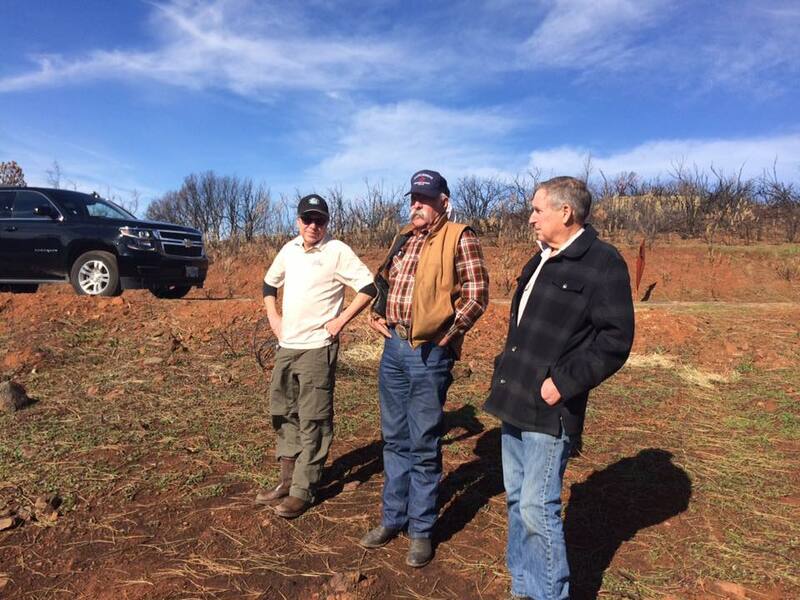 When we stopped to look at the Butte Fire on Thursday, ranchers Doug Joses and Bob Garamendi pointed out the small ranches that no longer existed. According to Doug, "Everybody up here had 75-100 sheep, maybe that many goats, and usually a few cows." Because of the grazing, he said, fuel didn't have a chance to build up. Today, the children and grandchildren of many of these ranchers no longer graze livestock. And because there were fewer residences - and because the families that did live there ranched (at least part-time) - controlled burns were a regular occurrence. "Just about every weekend in late July and August," Doug said, "we'd go to a control burn on somebody's ranch." Bob Garamendi said that he could remember CDF (as those of us of a certain age still call CalFire) doing cooperative Vegetation Management Program (VMP) controlled burns on private ranches into the early 1980s. VMP burns are increasingly rare today. As more people have moved into the Sierra foothills, the liability associated with prescribed fires has limited our ability to use this tool. Consequently, we have fuel loads that are far beyond anything we've experienced in the last 100 years (at least). We drove Jesus-Maria Road through the Butte Fire - and our local guides told us that there were places on the road before the fire where the brush enclosed the road like a tunnel. After 4 years of drought, and with low humidity and moderate winds, this fuel pushed the fire faster than most of the folks fighting the Butte Fire had ever seen. As we drove through the fire, I was reminded about the importance of knowing the land. Doug and Bob both grew up on the ranches they currently manage. They know the landscape intimately. Bob talked about helping a couple of dozer operators find a safe route for constructing a fire line during the fire. Doug knew where the fire would likely "lie down" because he'd grazed the fine fuels and brush with goats, sheep and cattle. A satellite photo or a topographic map can't provide this level of detail. I've experienced GPS systems that show a road that no longer exists or a creek crossing that is impassable. This local knowledge is critical to stopping a fire - and to keeping firefighters (especially those from out of town) safe. While I understand the reluctance of professional firefighters to include "civilians" in fire suppression efforts (as well as the liability involved), local, on-the-ground experience would be helpful, it seems. Local knowledge extends beyond the landscape - community connections are also an important part of the story. Again, Doug provided a useful (and humorous) illustration. At one point during the fire, Doug had two water trucks (6,000 gallons of water) held up a mile from his ranch by a CHP roadblock (this was before CalFire had been able to get to the ranch). 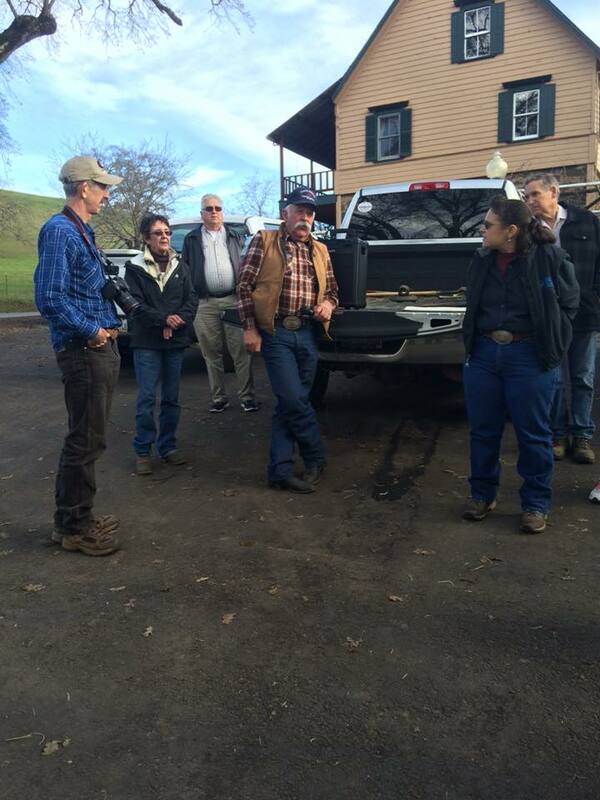 CHP refused to let the trucks through, and even told Doug that they shouldn't let him return to the ranch. Doug called the sheriff's dispatcher in San Andreas (who happened to be his ex-wife - they'd divorced 40 years ago). After calming him down, she made a few calls to CHP in Sacramento, and the trucks were released. To me, this illustrates the importance of the connections that those of us who have lived and worked in rural communities all of our lives have made and maintained. 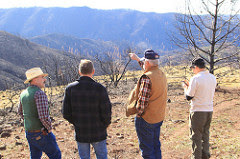 During our conversations with firefighters during the tour, I was struck by how high-tech fighting wildfire has become. Improvements in communications, mapping technology and equipment have made fighting wildland fire easier (and potentially) safer than it once was. But sometimes, I think, we make the mistake of thinking our technology is infallible. With computerized mapping capabilities, I fear that we may be forgetting how to read paper topographic maps (for example, do you know how to tell a ridge from a valley on a topo map?). Several ranchers who had private land and public grazing allotments within the Rim Fire related stories about having to tell fire managers that the fire had burned beyond the perimeter shown on their "updated" maps during a morning briefing. Despite our tremendous advancements in technology and knowledge, sometimes on-the-ground knowledge trumps aerial photography and modeling. All of this brings me to my own small ranching operation. I've written in the past about wildfire as it relates to our sheep business (see this post, for example). When I see smoke on the horizon in the summer and autumn months, I call the ranchers I know who might be in the path of the fire (and they call me when they see smoke in my direction). If I'm grazing sheep on dry forage or in brushlands, I make plans for how I'd evacuate the sheep in a fire. Even when I'm indoors, I listen for the sound of low-flying fire aircraft. So before our foothill rangelands turn golden this summer, I'm going to take the initiative to talk with my neighbors and fellow ranchers. I plan to organize a breakfast meeting with other ranchers to talk about how we might help with fire prevention and even with fire suppression. I intend to reach out to our local CalFire folks so that they know who the large landowners are in our community - where the gates and ranch roads are, where the stockponds are that might be a critical source of water during a fire. And I'm interested to know if others have ideas about this topic, as well.